Aadrian, 17 Apr 2014I don't even need to read this comparison to know the S5 would be considered better in almost ... moreIn build quality, every phone makers have their styles and esthetics. You cannot expect all phones to have same body build, it's all about bringing the best out of the type of body you choose and tell the world "nothing can be better". HTC fanboy! I don't even need to read this comparison to know the S5 would be considered better in almost every aspect, of course. Though I would still prefer the HTC One over the S5, I would even prefer the HTC One M7 over the S5. But if there's a tie in build quality... I'm not gonna take it seriously anymore. AnonD-79015, 17 Apr 2014Design and Build Quality:M8 Touch Screen Response: M8 Display: S5-marginal Battery Life: sl... moreI agree with you. Experience is what should be seen. Even I feel M7 experience is better then S5 and M7 appears faster. But looking to size of M8, I find S5 experience better. Also Camera of M7 and I think M8 are no match. Overall S5 wins except in design. 1. 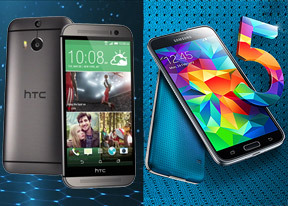 Looks of HTC One is at any day better then S5. It should not be a tie. 2. Though Samsung has many software tricks in its sleeves, still HTC Sense is a better UI experience. Samsung is not as smooth and effective as Sense.Sense is more polished and sober. 3. Screen of HTC is sharper but not punchy. All other things are better in S5. Overall I agree with this review. S5 is better due to battery, Screen, and great camera. S5 is the winner oke but what about the telephony ?? And signalstrenght , reception ? If you disagree with this, stop being a fanboy and actually read the well-written review. Everything is fully explained and to disagree you have to be blinded by brand hatred. HTC's camera is an epic fail. They should have just joined the megapixel race. Different doesn't necessarily mean better. Galaxy S5 wins this. Its just better overall. The only bad thing about it was the design which is really not that ugly when you hold it in the hand. PS: Hope you release your review on the Xperia Z2 soon. I'd like to see how it fares against these two. Anonymous, 17 Apr 2014A very fair comparison by GSMArena. People just have to admit that Galaxy S5 is not as shabby ... moreExactly the comment I had in mind. Unfortunately, Samsung has developed a sort of a hater's cult against it, due to it being the new oem to beat. To be honest, I used to hate Samsung quite a bit until I got into the Note series. Now I understand that I've been mislead by simple fanboyism for the early years of the S1, S2, and S3. I don't think the s5 should have the CPU clock speed advantage noted as a pro as the one m8 in some regions has the same SOC. A very fair comparison by GSMArena. People just have to admit that Galaxy S5 is not as shabby a phone as some haters portray and HTC One M8's camera is a fiasco and overall not that big of a upgrade over M7. Great phone , both of them , nonetheless. I know that 90% of the people commenting here will hate GS5 , but 90% of the people out there in the real world would definitely buy GS5 over M8 when it comes to purchasing and that is the truth. Is "diamond arrangement " is new fancy name for pentile ? I still believe the S5 feels cheap compared to HTC One. Would pick the HTC any day but admit that the camera is superior on the S5.